Just How Deadly are Smartphones? October 30, 2017 | The Collins Law Firm, P.C. Are you aware that a simple, very common habit that you refuse to give up could end your life? Or your child’s? Or a stranger’s? Every time you decide to save time in your busy schedule by talking or texting on your cell phone in the car, you are taking this chance. 1) More Americans are using smartphones while driving in the U.S. From 2014 to 2016 the share of Americans with a smartphone rose from 75% to 81%. 2) Americans are also using their smartphones differently. We are texting, and using Twitter, Facebook and Instagram more, activities which all take up much more of our attention than simply talking on the phone, which in itself is very distracting. 3) Finally, the surge in fatalities has been among pedestrians, motorcyclists and bicyclists, who you might not see if you are glancing at your phone instead of concentrating on the road. In 2015, 5,987 pedestrians were killed, a 22% increase from the year before. Safety regulators and local police departments know that talking and texting on the phone while driving can be dangerous. However, they don’t know the true magnitude of the problem because data correlating smartphone use and accidents is hard to obtain. A recent study by the National Safety Council found that only half of fatalities tied to known mobile phone use were recorded as such by the National Highway Traffic Safety Administration. And this doesn’t even consider the fact that the NHTSA gets its data from the states, most of whom don’t require police officers to even consider mobile phone use as the cause of an accident. This lack of data does not alter the fact that our smartphones are much more distracting and therefore more dangerous in a car than ever before. And Americans are addicted to them. 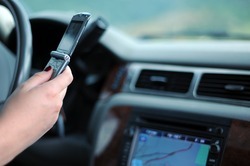 A company that analyzes smartphone data found that drivers use their cell phone on 88% of their trips. If the same company said 88% of us are driving drunk, there would be a hue and cry and something would be done. Activist groups have made us all aware of the dangers of drunk driving, and laws have been changed. The unfortunate fact is that it is going to take a similar cultural shift to make us give up using our smartphones in the car –something we all do. We must get to the point where we regard smartphone use in the car the same way as we view drinking and driving. Until then, it will never be a priority for us, or for lawmakers, investigators and prosecutors. And until then, more people will die needlessly. So, it’s time to ask yourself a question. Is your busy life really so important that you have to turn your car into a 4000 pound, 40 mile an hour weapon? Is that text really worth dying for? Or killing for? Put your phones down. Now.